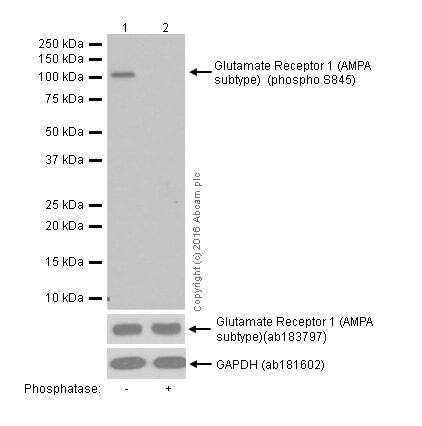 ab76321 only detects Glutamate Receptor 1 (AMPA subtype) phosphorylated on Serine 845. 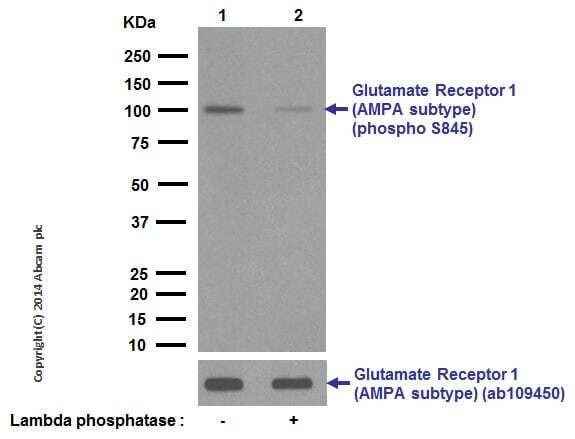 Synthetic peptide (the amino acid sequence is considered to be commercially sensitive) corresponding to Human Glutamate Receptor 1 (AMPA subtype) (phospho S845). WB: Human fetal, rat and mouse brain tissue lysates. Our Abpromise guarantee covers the use of ab76321 in the following tested applications. Lane 2 : Mouse hippocampus whole cell lysates. 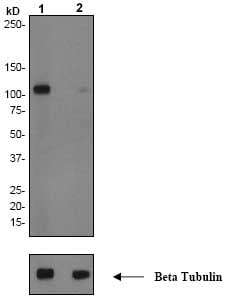 The membrane was incubated with phosphatase. 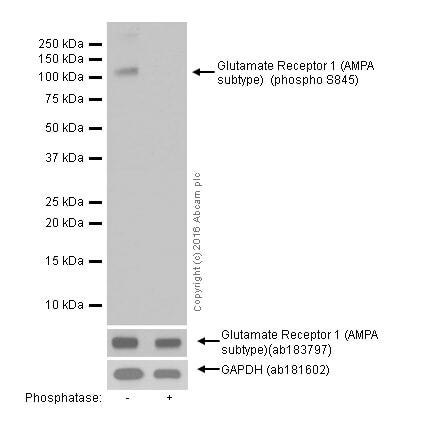 Dot blot analysis of Glutamate Receptor 1 (AMPA subtype) labelling Glutamate Receptor 1 (AMPA subtype) (phospho S845) with ab76321 at 1/1000 in 5% NFDM/TBST. 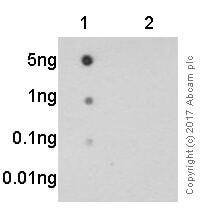 Goat Anti-Rabbit IgG, (H+L), Peroxidase conjugated (ab97051) (1/100,000) was used as the secondary antibody. Exposed for 3 minutes. Lane 2 : Human cerebellum whole cell lysates. 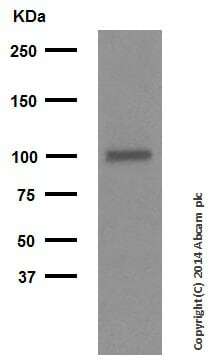 The membrane was incubated with phosphatase. Observed band size: 106 kDa why is the actual band size different from the predicted? There are currently no Customer reviews or Questions for ab76321.